Clear Aligners: Clear aligners straighten teeth invisibly, without metal braces. Invisible - Clear aligners show off your smile, so most people won’t even notice you’re wearing them. Removable - It’s easy to remove aligners and eat whatever you like. There are no wires to trap food or get in the way when you floss. 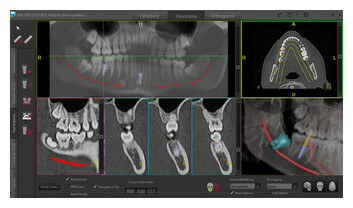 Precise implant planning is only so good as its implementation. Veristic Surgical Guides provide the seamless link between implant planning and actual treatment, guarantee predictable implant treatment and thus dramatically increase case success. Veristic Surgical Guide helps you to predictably transfer your treatment plan into clinical reality. Complete information about the quality and quantity of the bone makes it possible for you to determine the ideal location for your patient's implants. This will increase the probability for a successful operation. Knowledge of the exact location of important anatomy, such as the mandibular nerve and the maxillary sinus cavities, provide confidence that implant placement will proceed smoothly and safely. Surgical guide help ensure that all of your patient's implants are properly placed using all of this valuable information. Once you start to utilize surgical guide, the time taken for the entire procedure of surgery would drastically come down. 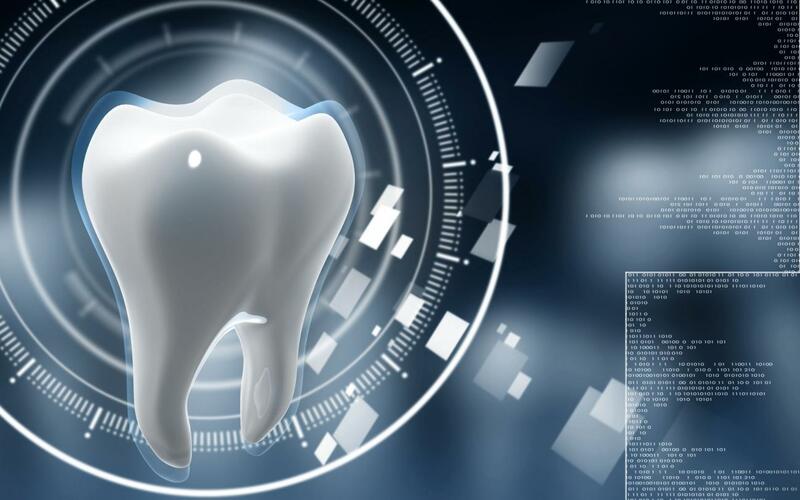 Besides, you will minimize any future complications that might arise out of an implant surgery done since you have a thorough knowledge of your patient's anatomy. Surgical Guide ensures that you get a detailed plan of the procedure and accurate realization of the different components involved. Incidentally, you will start to make more and more cases with higher profit margin. Scientific studies show that the use of surgical guides along with a 3D implant plan results in increased esthetic outcomes. Incidentally, you would be able to produce results that look quite natural. We achieve these superior results by ensuring that the process of restoration is taken into account while planning the implant process. We understand that no two cases are the same. That's why each and every Veristic surgical guide is custom made from the ground up to fit the implant plan and patient's anatomy. Our guides are available with tooth, bone or mucosa support. Computer guided surgery isn't just about accuracy, it's also about saving your and your patients' time. Surgical Guides allow you to reduce surgery time by up to 70%. 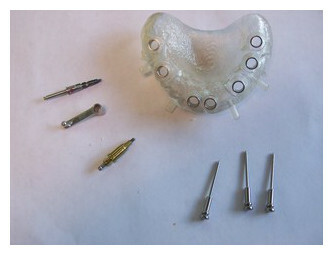 You can order an Implant Analogue Model (IAM) with your surgical guide to help you give your patients beautiful provisional restorations based on your computer guided treatment plan for that instant perfect smile effect! Virtual demonstration of the 3D structures on a 2D computer screen facilitates understanding of the complex anatomy. 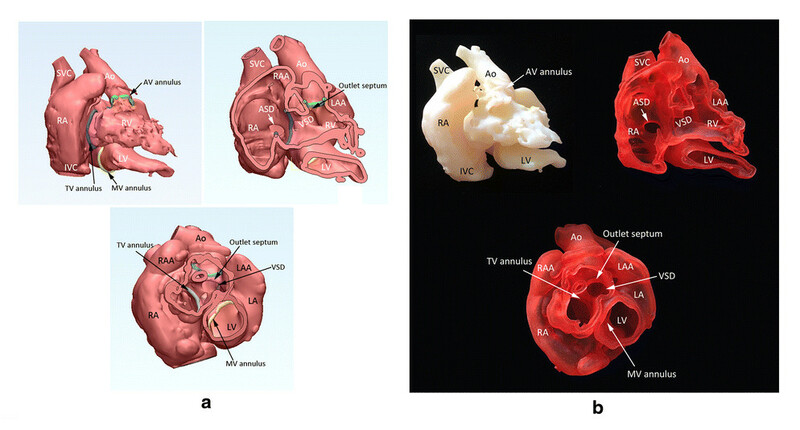 3D printing takes a closer step toward the reality by providing the physical replicas out of the digital data processed for the virtual models.Veristic Simulation Platform enables surgeons to visually communicate and collaborate on the outcomes. Before 3D printing, the surgeon had to figure out which stent to use by looking at a 2D image and taking measurements. Now, the surgeon can practice on a different 3D printed body parts for each patient and design a surgery process that is specific to the patient’s needs. Having a 3D printed body parts can reduce patient time in surgery and can even give the surgeon an opportunity to show the model and explain different processes to the patient and family members. Guided implant surgery provides a wealth of information on the bone, bone density, soft tissue, location and nerves. The DICOM le, or rendering of the patient’s anatomy, is integrated into a guided surgery software program. There, the doctor can virtually place an implant and run a series of tests to ensure its best location outcomes. Most of the 3D printed implants with the help of a CT scanner, the parts can be tailored to the individual for a much better fit. This makes the surgery more efficient, the recovery faster and the patient’s quality of life significantly better. It even makes the doctor’s job easier, which ensures the hospital can treat more people. 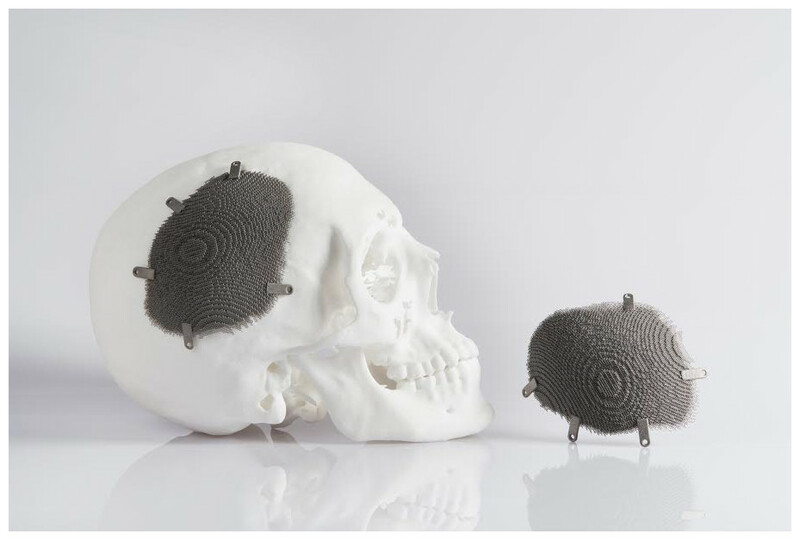 The rapidly expanding technologies of biomedical engineering and medical 3D printing have been used to correct both inherited and caused deformities to the body’s most sensitive areas: the skull and internal organs, bones, and tendons. Vertebrae, cranium, and mandible—as well as acetabulum (hip bone), tibial, and femoral—replacements have all been performed using implants created with additive manufacturing. 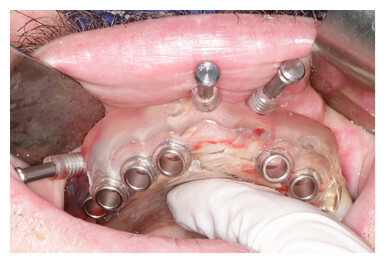 A Novax DMA cranial implant. Courtesy Novax DMA.